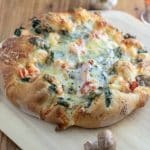 This Lobster Pizza with Spinach and Gouda is a decadent treat for any night of week! Use a store bought pizza crust for this Lobster Pizza! It’s quick! Dear God, I think I’ve died and gone to Heaven… No Seriously!! THIS IS THE MOST SCRUMPTIOUS PIZZA I HAVE EVER HAD!! No, Seriously….. It is super easy and so delicious! Want to pretend you are in heaven too? Make this Lobster Pizza! Contrary to Popular Belief, Lobster is Healthy!! My husband’s nephew, well not really, his 2nd cousin once removed, but he’s slightly older than our eldest son and it’s just easier to say Uncle and Aunt for his four year old. Okay are you still with me? My nephew and his four year old have been coming over most Sunday afternoons for dinner and fun. Wayne is a stupendous cook in his own right and we have a blast hanging in the kitchen and coming up with fun stuff to eat! His four year will absolutely eat ANYTHING you put in front of him, I love it! So the boys had it in their heads that they wanted Lobster Alfredo a few weeks ago. But REAL Alfredo as my nephew says, “F&%@ that Cashew milk!” …. in other words, heavy cream! So, feeling a bit sorry myself since I couldn’t eat it, I said OK but I need a cup or so for my own dish. After a trip to the local fish monger we were armed with our culls, which are not prefect (usually missing a claw) so they are only $6.99 a pound. Which is cheap for our area. Have you heard that lobster has a lot of fat and is unhealthy? Nothing could be farther from the truth. That is, if you skip the butter!!! At less than 100 calories per serving, lobster has less calories, saturated fat and cholesterol than beef, chicken or pork!! Surprised? Check out this article!! The little man checking out the lobster! Soften onions in large saute pan. Cook on medium low until slightly browned. Saute and stir until barely wilted. Roll and stretch out pizza dough. Add spinach mushroom mixture to top of dough. Bake at 450°F for about 15 minutes, until crust is nicely browned. Pizza with a twist! Elegant enough for company! Saute' onion in olive oil until soft. Add mushrooms and continue sauteing until lightly browned. Add spinach and stir until just wilted. Remove from heat. Preheat oven to 450°F. If you have a pizza stone, heat the stone. I sprinkle corn meal on parchment paper and then slide the parchment onto the stone because I don't have a pizza peel. Stretch dough and roll into 10-12" round. Spread mushrooms and spinach evenly across dough. Top with lobster and then the cheeses. I love this idea and I have to tell you the little boy with the giant lobster is adorable lol! This will be something we test out and soon. I love lobster and so does my husband so I think we have a winner recipe to test. Thank you Heidy! I hope you enjoy it! Let me know! I have some lobster fans in my house. This would be their dream dinner for sure! Annemarie, thanks so much for your comment! Have a nice weekend! Wow what an interesting flavor combo. I love the sound of this. Looks absolutely delicious and soooo good. Can’t wait to give this a try. Thanks so much, Natalie! I hope you enjoy it! My mom used to say I was a cheap date because I don’t like Lobster. Today, my fiance says more for him! Funny how things work out. I’m passing this along to him because he loves both lobster and pizza and will surely enjoy this! Good for your fiance! He is a lucky man! Thanks for the comment, Lauren! I definitely need this in my life! Pizza with lobster on top!? Yes! I’ll take a few slices please! I’ll have to make you some! Come visit me! Thanks, Elaine! Thank you Sonia! It is super flavorful! Have a nice weekend! Nothing is better than homemade pizza! Great photos. Why tahnk you so much, Amanda! Have a great day! You’ve just combined my two favorite foods! Homemade pizza is the best! Me too! Thanks Nikole! I love homemade pizza! I need to get some lobster! This pizza would go down an absolute treat in our house. My kids are pizza crazy and love trying new combos. It is super good! I think you guys will like it! Thanks Anna! Oh goodness, this lobster pizza looks amazing. I love lobster and gouda! Going to add this to our meal plan for sure! Thank you Alexis! I hope you enjoy! Wow lobster pizza sounds so exotic. I love lobster although I don’t cook it very often. I’d love to make this . Would go so well with a glass of champagne, don’t you think? It is so good! I think champagne would be delicious! We make it for date night a couple of times of year! So good! Thanks Noelle! Spinach and cheese – this one will never get old! Do you think I can substitute salmon for lobster? Or any fish? Shrimp would probably come closest, right? I think I would break salmon up, if trying to substitute, but I have never tried it. Shrimp would certainly work! Thanks Marie! Yum! This was amazing pizza! It was d e l i s h! 🙂 Just go and make it. It’s easy, fun, and you will be happy. 🙂 Thanks for posting! Oh great! I’m so glad you enjoyed it! Thanks so much for coming back and leaving a comment, Mary! Lobster on pizza sounds amazing. So easy, but really luxurious too. Yes, it is slightly decadent! But sometimes we are worth it. Right Dannii? Thank you! Lobster pizza sounds like a fantastic creation. Thanks for sharing this recipe. Thanks Lucy! I’m glad you enjoyed this!